Waiheke has been named the best Island in Australasia & the Pacific for the second year in a row. Clearly whoever judges this is not into Bass Music Festivals, as it didn't have one.. until now. 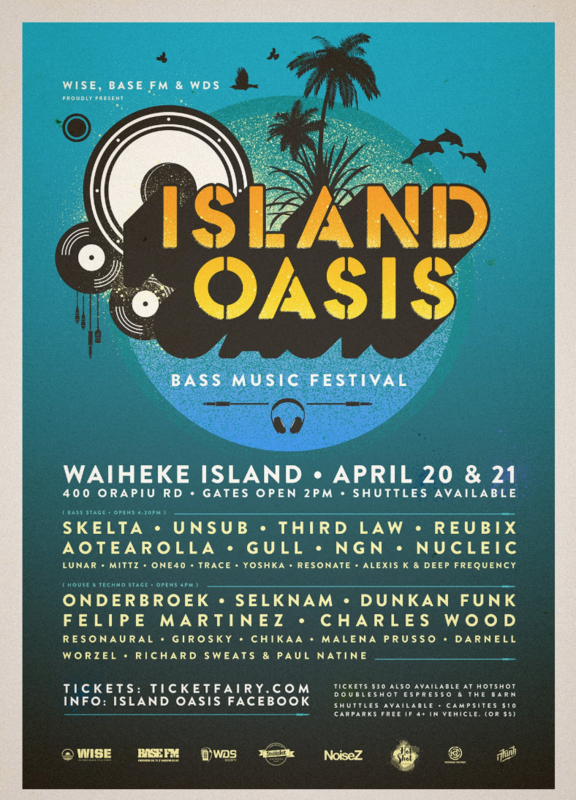 Yes Yes, Waiheke Island Style Events, Base FM & Waiheke Documents & Security proudly present "Island Oasis"
With Ferry & Island Transfer packages available, and over 24 hours of music over three zones, this is the smorgasbord of deliciousness that all of you onto-it audio enthusiasts have been waiting for. If you would like to grab the super good value $99 including all fees and transfers combo ticket, you leave Auckland at 2pm Saturday (Either downtown or Devonport) and leave the site at 4:20pm, to be on the 5pm Sunday sailing home. If you would like to come earlier or stay later, you can still purchase Ferries and shuttles separately as an add-on (Select just your entry ticket and go through towards checkout, where the add-ons are available. Shuttles can collect you from 2 pickup spots on the island, but if you have specific needs there, we may be able to pickup from where you are. Set in a lush valley, with plenty of room for camping, on-site catering, free water, art installations and roving entertainers a plenty, there are plenty of reasons to escape the dripping sweaty clubs of the city, and get yourself in front of a fat stack in the bush. You can purchase camping for Friday & Sunday nights too, so feel free to settle in for the weekend. There is a heap of Jazz and other music on around Waiheke during the day and early evenings, so check that out and rock on home to the Oasis when you fizzing on the afterparty! It literally is just 20 mins to almost anywhere on the island, so its easy to get around! The Artists cover a wide range of styles from Dub, Reggae & Hip Hop, through House & Techno and into Dubstep & Drum & Bass. Earlybird Tickets are just $30, and if you would like to purchase an open ferry ticket, a campsite or a carpark you can do so. (Select your ticket, and then go through to the Add-ons) We will refund carpark fees if you bring at least 4 people in your car. Check the facebook / Instagram pages for more details.